Scatter the baguette slices on a large baking sheet and drizzle with EVOO, salt and pepper. Put into the oven and toast for a few minutes. In a large skillet over medium heat, cook the bacon until crispy, about 4-5 minutes. With a slotted spoon, remove the bacon and reserve the fat. Add the onions to the hot bacon fat and caramelize for 10 minutes. Add in the apple. Season with salt and pepper; cook for another few minutes. Return the bacon to the pan and combine. Remove from the heat and put the topping into a serving bowl. Top with cheese and serve with the crostini alongside. In Recipes-list.com we have selected the most viewed recipes from category - uncategorized . Enjoy the best recipes specially selected for you! 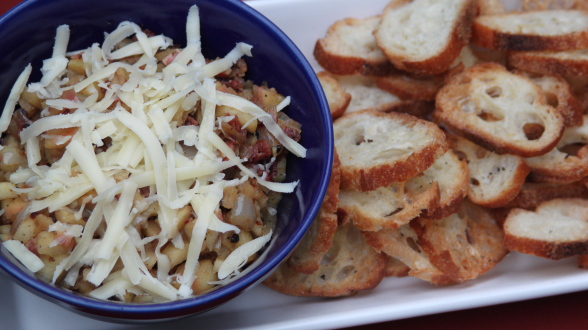 Apple Bacon Cheddar Crostini is the right choice that will satisfy all your claims.